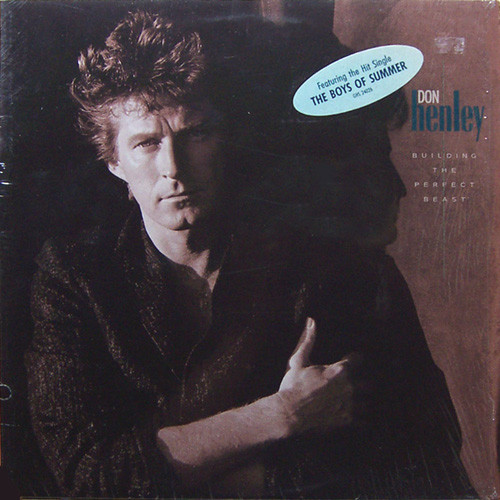 This was Don Henley's second solo album after all those years with The Eagles. As with so many eighties albums, it is easily identifiable as being very much of its time - polished, sharp production, crisp sound but layered with synthesisers. 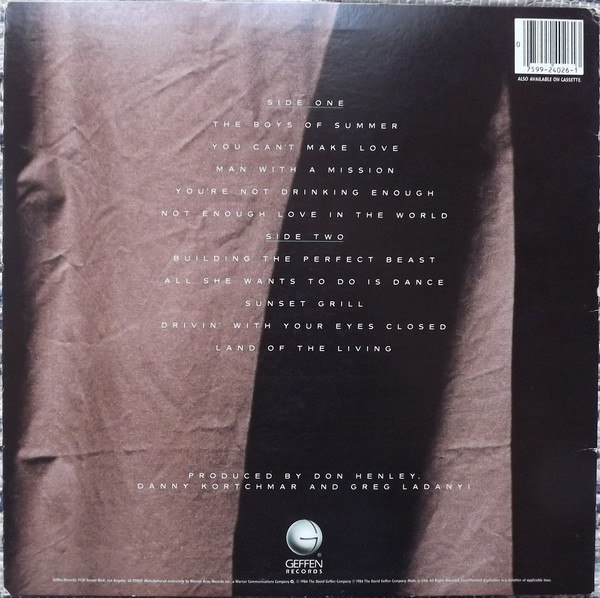 Lyrically, Henley (together with Danny Kortchmar) always has the tendency to go a bit deep and reflective, and also political in his concerns for the well-being of the world. It is again, though, very much of its era. Despite its mainstream pop radio production, Henley still wants to get his message across, and he does, which renders this still a credible album. "The Boys of Summer" is a wonderful opener, ideal radio driving fare, full of summery atmosphere and a nostalgic feel to the lyrics too. Henley's recognisable Eagles voice is ideally suited to the track, although the eighties production is a little tinny. 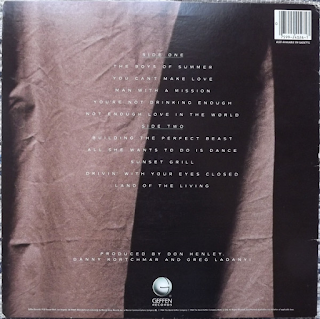 As yet, the album does not appear to have been remastered. For me, the track would be much better with "real drums" as opposed to those eighties synthy, muffled drum sounds. "You Can't Make Love" is a slow-burning but atmospheric number with a soulful, appealing vocal from Henley. "Man With A Mission" is a rocking romp which again could be improved with better instrumentation. It certainly rocks though, full pelt. "You're Not Drinking Enough" is a mournful, Eagles-style country rock ballad. "Not Enough Love In The World" is a sumptuous mid-pace, moving number. Lovely vocal, lovely feeling to it. Henley's gritty but evocative voice is at its absolute best here. It has echoes of John Waite's "Missing You". The title track is a suitably industrial grinder with an intoxicating, shuffling beat but too much synthesiser for me. It could be so much better, I have to say. Despite that, it is still a good track. Those synth drums continue on the next number, "All She Wants To Do Is Dance", which is very much a song of its time. Everything about it screams "mid-eighties". Even The Rolling Stones and Queen were putting out stuff like this. There is a good riff in there somewhere, though. "A Month Of Sundays" is a plaintive, piano ballad with some meaningful lyrics about agricultural decline and inter-generational disconnection. It is probably the best song on the album. It merges into the appealing rhythm of "Sunset Grill". Just when I was starting to enjoy it, though, in comes a huge synthesiser riff. Another eighties riff powers "Drivin' With Your Eyes Closed". "Land Of The Living" is a short but pleasant number to finish on. This is certainly not a bad album, but for me it is too representative of its time to justify my digging it out too often. I much prefer Henley's Eagles work or his 1989 "End Of The Innocence" album.